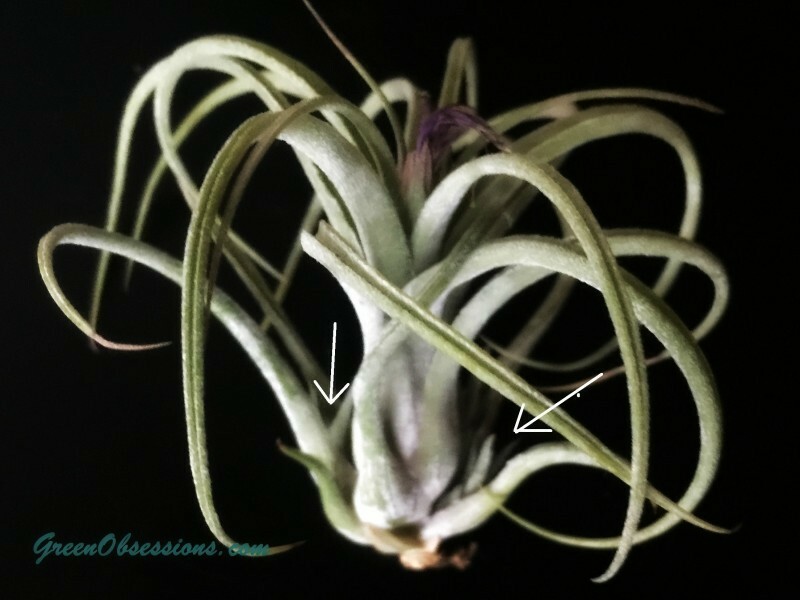 I was so excited to see new pups on my air plant, Tillandsia victoriana, that I thought this might be a good time to write about these unusual plants.The new pups are very tiny and hardly visible but you can see new growths to where the arrows point. Airplants are epiphytes and belong to the bromeliad family. Normally, they grow outdoors and in tropical regions attached to to bark, trees and , rocks absorbing moisture and nutrients through their leaves. They can also live indoors with proper care. I discovered air plants when I visited the butterfly show at Carleton University last year. There was this strange looking plant attached to a tree and I wondered what it was. Once I saw it I knew I had to have it and after much searching and no luck, my husband surprised me by taking me to a plant shop filled with air plant s. The last plant shop I would have looked. Since then I have acquired a good number of air plants, mostly from Rona. 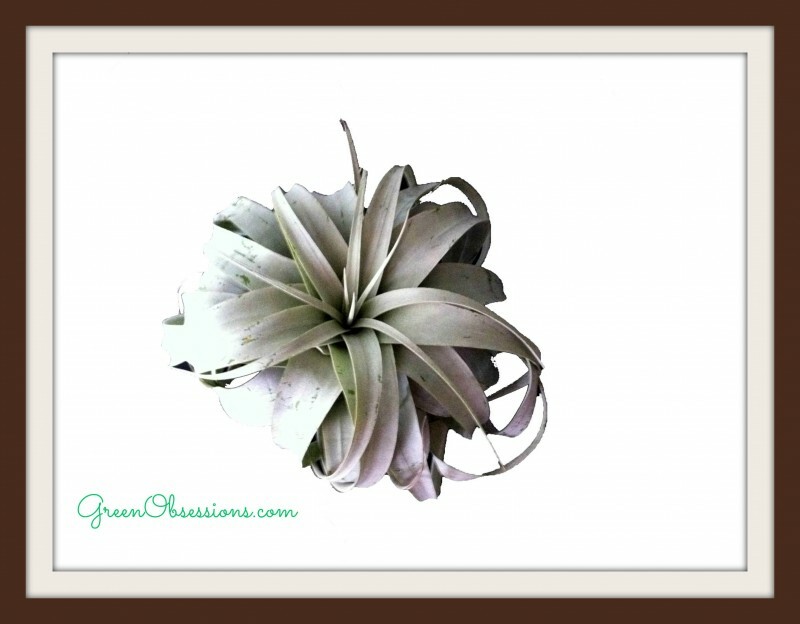 Air plants usually have green, silver or reddish leaves. Most change colour when about to bloom and the colour of the flowers can be red, yellow, orange, pink and purple. The leaves on my air plant that bloomed changed to a slight pink and had bright purple flowers. The blooms can last from a few days to months. Mine bloomed in the summer and 4 months later, it is still visible although withering now and not as pretty. Once they bloom, they set out little air plant babies or pups. I, plan to leave the pups attached to the mother as they look beautiful in clamps. If that is not desirable, pups can be gently separated from the mum. I read that the mum usually dies once it has flowered and set out pups. Mine has not yet died since flowering so I am curious to see how long they live once they bloom. Air plants make excellent houseplants in cold climates like Canada. They are wonderful conversation pieces and are easy to care for and will thrive as long as these three requirements are fulfilled: water, good air circulation, bright light. Water: Most people who have seen my collection of air plants always ask me, “Air plant? So they don’t need water?” Air plants NEED water like other plants! Too much or too little water will cause them to die. The plant shop had an air plant care sheet which said to water it 2-3 times a week by light misting. I later found out light misting is not enough. The plants are always left looking dry. Instead I water mine thoroughly by wetting the leaves until water runs off them. I do this by spraying heavily with water once to twice a week, or soaking them in a water bath about once a month for about an hour. This may not be the gospel, but it seems to be working for me. I used to soak my plants weekly and for long periods of time as I thought this was the proper way, however this sort of watering caused my xerographica and my first bulbosa to die from rot. Submerging in water may be helpful if plants are drying out (i.e. when you see an exaggeration of the natural curl of the leaves). Be careful not to submerge the flower in water if your air plant is in bloom as the water will dissolve the flowers. Allow the plants to dry before watering again. While waiting for my plants to dry, I turn them upside down to ensure the base of the plant is dry. When water sits at the base of the plant it contributes to rot. I let the plants stay that way for a few hours (roughly 4 hours) until they are thoroughly dry before returning them to their homes. THE TYPE OF WATER USED IS IMPORTANT. Air plants prefer natural and clean water which means rain water is ideal. Do not use softened water due to the salt content and avoid distilled water as well. Instead you may use filtered tap water that has sat out long enough for the chlorine to dissipate. This is the technique I use for my air plants. I fill a jar with water and let it sit open for a day or two before using and my air plants do not seem to mind it. Air Circulation: Moving air allows the plant to dry in between waterings which is helpful in preventing problems from overwatering such as rot. This means, if you are placing your air plants in containers, make sure they are open and not closed containers. An open glass globe makes a nice decorative piece. Light: The best place for an indoor air plant is a south, east or west facing window which typically has bright light. My air plants sit near a north-west facing window as unfortunately, this is the best position in my apartment for bright light both in summer and winter. In winter, direct sun in my north-west facing window is practically non-existent. The plants tend to do much better in the summer when they get some sun in late afternoon. Air plants can tolerate direct sun in winter and prefer indirect bright light in summer. Placing them in direct sun in the summer months risks them of being sunburned. You can fertilize air plants as well with water soluble fertilizer but I have not yet tried this. 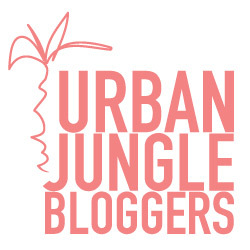 Fertilizers designed for bromeliads and air plants are recommended. Optimum temperature for air plants would be 10- 32 degrees celcius, but warmer temperatures are best as they are from tropical climates. 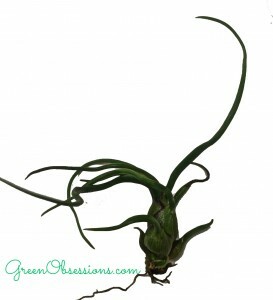 Air plants can be displayed in a variety of ways and their display will only be limited by your imagination. I have my air plants in a hanging glass orb, in tiny glasses or lying on the window sill. Browsing air plants on the internet can give you more ideas- glueing them to tree branches, driftwood, shells, rocks… the possibilities are endless. 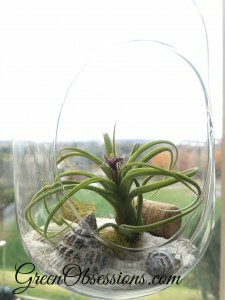 Now, who is getting an air plant after reading this article or already has one? Anyone? No you don’t. just place them anywhere with good a good light source and you’re good to go. I bought 2 air plants, one died. I can get the tillandia’s in the oak trees in Florida. I have had 2 air plants die on me as well, but I’m finally getting better at keeping them alive 🙂 thanks to trial and error.